Fresh floral centre-pieces. Our creative florists will be pleased to assist with a tailor-made floral arrangements to suit your wedding reception theme and budget. Lavish Buffet Lunch / Dinner. One room Included into the Package for Wash & Change. Decorated Place for the Reception & Dinner. A dedicated wedding specialist will attend to you throughout the arrangements and on the wedding day to offer an unforgettable memory to your friends and family. Contact us on +91 1416700700 for a professional and reliable wedding professional. Our dedicated catering staff and culinary team will design a menu to suit the setting of your choice. Our creative team of florists will be pleased to assist with any kind of tailor-made floral arrangement to suit your theme and budget, from your table centerpiece to a personalized hand bouquet. Our reputation, experience and skill enable us to create the perfect cake for you. Choose from simple designs or elaborate multi-tiered masterpieces by our pastry chefs. Divisible into three sections for added flexibility; this is the perfect venue for up to 500 people theatre-style seating or 500people in banquet style. The Crystal can be easily accessed entrance via staircase from the Lobby Level. Q: Can I create my own menu? A: We offer a wide variety of wedding menus to suit all tastes and preferences. Our team of experienced chefs would be delighted to help you in creating customized menus tailored just for your wedding, based on your preferences. Q: Can I taste all the food before the wedding? A: A special menu tasting can be organized prior to your wedding day. This is applicable for set menus chosen for the wedding. For buffet tasting, several dishes can be sampled with prior notice of a minimum 48 hours. Q: How long will my reception last? A: Generally, a wedding reception comprises of a snack pass-around session of two-and-a-half hours plus a dinner buffet planned for four hours. You can extend the time if desired. Your wedding specialist will advise of any additional costs for additional time. As per state government law, alcoholic beverage service stops at 11:00 pm and DJ music is only allowed up to 10:00 pm. No alcohol is served after this time and we expect your cooperation as regards the music till 10:00 pm. Q: How far in advance should I begin planning? A: We are happy to begin planning with you at any time. We normally hire our Crystal Hall with a lead time of 45 days and give priority to those with a minimum guarantee of 200 guests. However, closer to the dates, depending on the availability of the venue, we are happy to offer our space to events with a lesser guest count as well. Q: Do you have suggested vendors for flowers, music, photography, etc? A: We work on a regular basis with several vendors. We would be delighted to provide recommendations and assistance with your wedding decorations, music, photography, videography, transportation and floral needs. Additional charges applied. Q: Can I bring my own preferred wedding cake design? A: Yes, you may bring your own wedding cake design at least three weeks prior to the event, and our pastry chef will advise you on the additional cost. Q: Does the hotel provide any entertainment with DJ ? Are there any permission required? A: Entertainment in the form of a DJ, performing artists etc… needs to be outsourced, as we do not have anybody in-house. However, the hotel would be happy to recommend artists. Otherwise, you are free to get it arranged on your own. Any DJ or live performer needs to have a bonafide performing license. Your event specialist/sales manager would be happy to take you through the details of these applicable licenses and from where you may procure them. Q: Does the hotel allow wedding ceremonies? A: Yes, we have a special Vedi area where you can perform the wedding pheras. Please contact our Sales manager / Food & beverage Manager for venue availability. Paradise Hotels & Resorts Jaipur offers well facilitated wedding venues and services. Our professional team will help guests translate their special moments into life long memories. 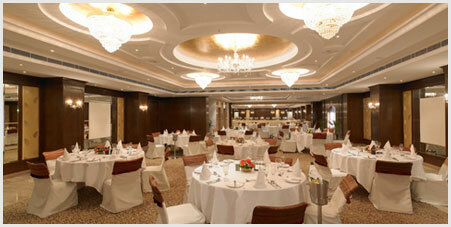 Specially selected banquet items are showcased to ensure an incomparable gastronomic experience. © Paradise Hotels & Resorts. All Rights Reserved.